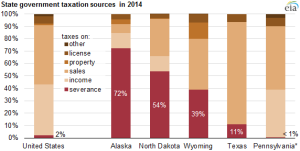 With the precipitous decline in oil prices, Alaska, North Dakota and Wyoming will be hurting. 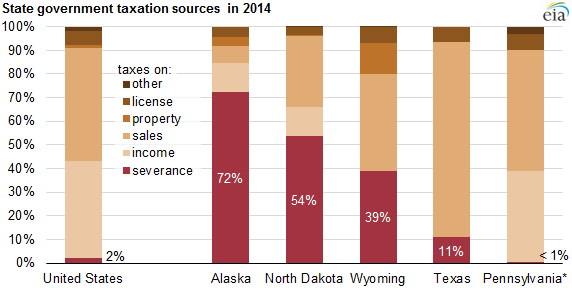 collected $931 million in severance tax revenues in the first quarter of 2015—more than Wyoming collects in an entire fiscal year. The first-quarter total is down 46% from the $1.7 billion collected in the third quarter of 2014. However, severance taxes cover only 11% of the state operating budget. Texas state and local governments also derive greater oil and natural gas revenues from state land leases and local property taxes. Like Alaska and Wyoming, Texas does not have an individual income tax. Most of the money in Texas’ Rainy Day Fund comes from severance taxes. In fiscal 2014, the Fund received more than $2.5 billion in severance taxes. In November 2014, Texas voters passed a constitutional amendment dedicating another portion of severance taxes to the State Highway Fund. Clearly, both funds will suffer from the drop in oil prices. Texas is most dependent on sales taxes for its revenue, and those too will suffer from the drop in oil prices. But Texas won’t suffer like Alaska, North Dakota and Wyoming. So far, the industry has staved off efforts in Pennsylvania to pass a severance tax.